In order to get sound in & out of computers at studio quality the Digital Audio Workstation software has to work hand in hand with hardware. Audio interfaces come in all shapes & sizes to fit all budgets. Buy the best you can afford & decide how many inputs & outputs you will require. 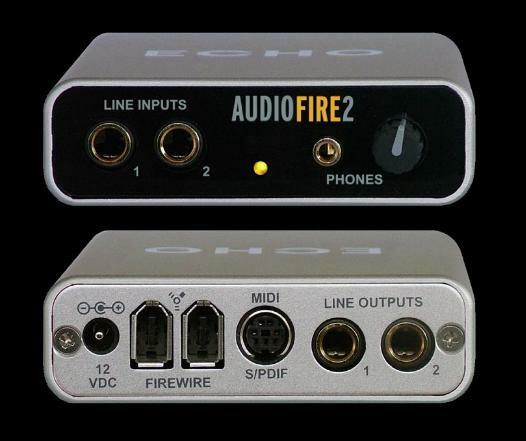 Below is an example of an audio interface that connects to the computer using firewire. There are others that connect via USB or PCI cards. On the front of the unit you can see 4 microphone inputs & also 4 line inputs. On the back you can see 8 x line inputs, 8 x line outputs as well as digital inputs & outputs & midi inputs & outputs. This interface could also be used by cueing software to play back the pre-recorded audio during a show. This interface offers 8 analogue inputs, 10 analogue outputs, 18 digital inputs & 18 digital outputs. For balance, below is a picture of a much smaller interface that offers only 2 inputs & 2 outputs. This obviously would be no use to record 4 musicians simultaneously. Nor would it be a good choice for using cueing software where often you will require 6 or more outputs to feed 6 or more speakers in the auditorium.